Help, how to topics > Library Patrons > Library membership expiry date. You can set the patron membership period. This feature is optional. In the patron record set the expiry date value. You can generate "expired patrons" or "about to expire" reports. The Due date is always compared with the expiry date. 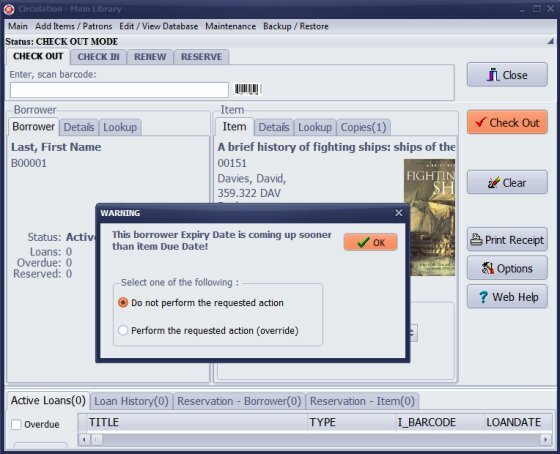 Warning message is displayed when the due date for checked out items is after the expiry date. Warning messages are displayed for expired members when they try to loan the item. 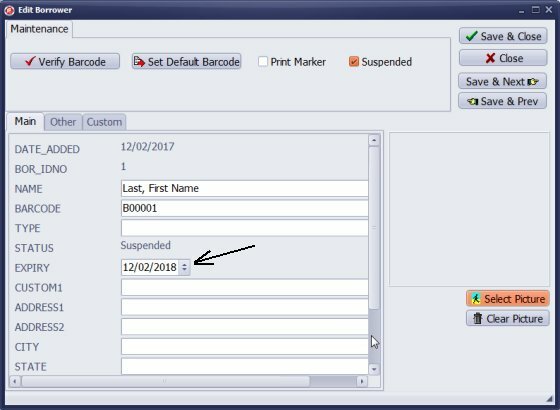 In the Borrower Edit window select the expiry date from the calendar. Warning messages are displayed for expired members when they are trying to loan the item(s). Your explanation to my last question was perfect. Thanks! Another question to which I could not find the answer on your website or in the manual is: How do you flag expired memberships and block them from borrowing and reactivate them once dues are paid? when warning messages are displayed for "expired patrons"